CleanMail Anti Spam Filter was designed to make the integration into existing e-mail environments easy and straight-forward. This is achieved by implementing the filtering engine as a transparent SMTP/POP3 proxy server. Another secret of CleanMail's flexibility is the highly versatile filter pipeline. It is designed to provide an open interface that allows integrating a wide range of third-party tools, e.g. for email classification, automated mail processing, server-based email encryption, or virus detection. CleanMail submits incoming mails to a series of mail filters, the so-called filter pipeline. 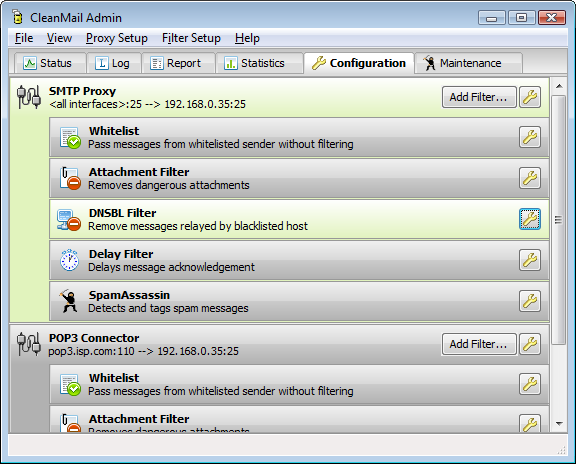 Examples of mail filters are the attachment filter, anti-virus blockers, or the SpamAssassin filter. Each filter analyzes the message and returns a result deciding how a mail is further processed. Messages can be delivered, tagged as junk, deleted, or redirected to another account. A sophisticated scheduler allows some filters to execute at the same time in parallel, while others are executed sequentially. The filter order matters: To help conserve resources and to increase throughput, filters lower down in the filter pipeline are not invoked if an earlier filter has already decided that a mail should be deleted. To learn more about the filter pipeline, about filter types and their effectiveness, please see the CleanMail Filter Tuning Howto. Most of your mail server's settings remain in effect. If you choose not to accept mails to certain recipient addresses, CleanMail won't accept it either. If you use SMTP AUTH, you can still use it after CleanMail has been installed. CleanMail automatically supports the same SMTP or POP3 extensions as your mail server. If your mail server is up and running, there is little change needed in its configuration to make it work with CleanMail. CleanMail does not implement the overhead of spooling mails until they can be delivered to your mail server. This eliminates potential problems before they occur, and makes CleanMail simple and straightforward to use. CleanMail never accepts mails on its own volition, it always makes sure a mail has been accepted by your mail software before acknowledging a successful mail transmission. Spam mails can be deleted outright, before they enter your system. This saves your money, as you need less storage, bandwidth, and less of your users' time. If a legitimate email is identified as spam (false positive), the sender will be notified that his message might not be read by the recipient. CleanMail provides a lot of different Mail Filtering Policies, which enables each customer to configure it according to their respective corporate policies. Accept & Deliver: spam mails are flagged and delivered to the recipient for further processing. Reject & Deliver: a configurable rejection message is returned to the sender and the spam mail is flagged and delivered to the recipient. Reject & Redirect: a configurable rejection message is returned to the sender, and the spam mail is redirected to a configurable mail account. Reject & Delete: a configurable rejection message is returned to the sender, the spam mail is deleted and not delivered to the recipient. Deliver: spam mails are flagged and delivered to the recipient for further processing. Delete: spam mails are deleted. A POP3 connector is a POP3 to SMTP protocol adapter. CleanMail's built-in POP3 Connector can be used to retrieve messages from a POP3 server, and forward these messages (after filtering) to a mail account on your SMTP server. The forwarding process implements a safe transaction scheme: Only mails completely transmitted and accepted by the SMTP mail server are deleted from the POP3 mailbox. Mails not forwarded (ie. spam messsages, if you choose to delete spam messages) are just deleted and never enter your mail server. Usually, CleanMail is a proxy only for a single mail server. Some users have more than one mail server and may want to filter mail for many servers and domains. CleanMail allows to configure an unlimited number of SMTP/POP3 proxy ports (or POP3 connectors). Each proxy has its own incoming and outgoing server settings and each has its own filter pipeline. You can use this to configure each proxy separately and adapt it to your needs. "We've made the switch from Clearswift Mailsweeper to CleanMail and we couldn't be any happier. CleanMail was simple to install and is very easy to administer. We spend less time working on spam filters/rules and more time with our customer projects. Thats a huge win for us and our customers. On top of that, CleanMail has been extremely effective with the reduction of spam in our mailboxes. The price of CleanMail is very appealing and has been nothing but a win - win for us. Excellent, stable product and excellent service. You have a true customer for life!" "If only all software houses even endeavoured to be as proficient, the world of IT would have a much better profile."